The name is SleuthER, Martin Sleuth-ER, and he hopes this finds you well, in good spirit and having a good day. 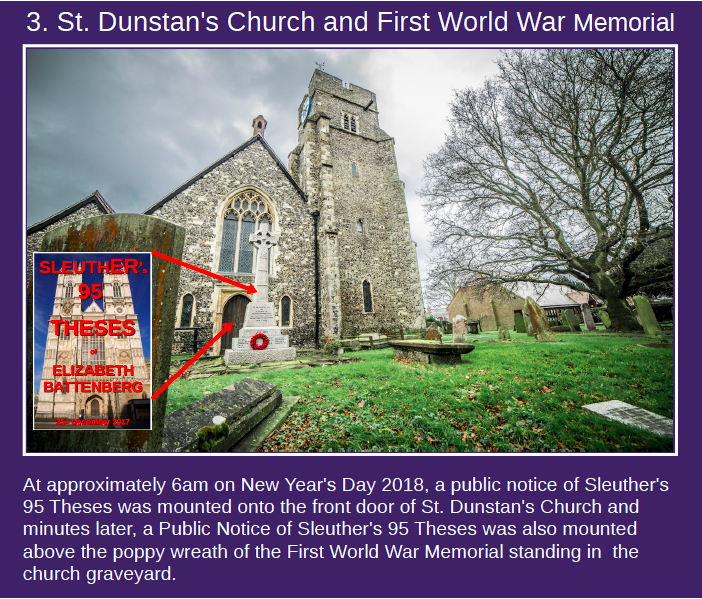 To signpost Sleuth-ER’s 95 Theses on Elizabeth Battenberg, as unleashed upon Westminster Abbey at 4am on Christmas Day 2017, and again on New Year’s Eve 2017, and to highlight the extent of the dissemination of Sleuth-ER’s 95 Theses across Great Britain during the 500th anniversary year of Martin Luther’s protest at Wittenberg. To highlight Christ’s seven-point requirement for churches throughout England. 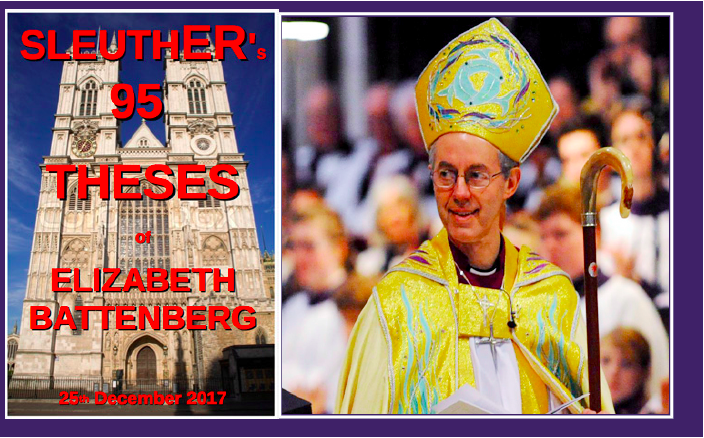 This report notifies The Archbishop of Canterbury of the existence of Sleuth-ER’s 95 Theses on Elizabeth Battenberg. 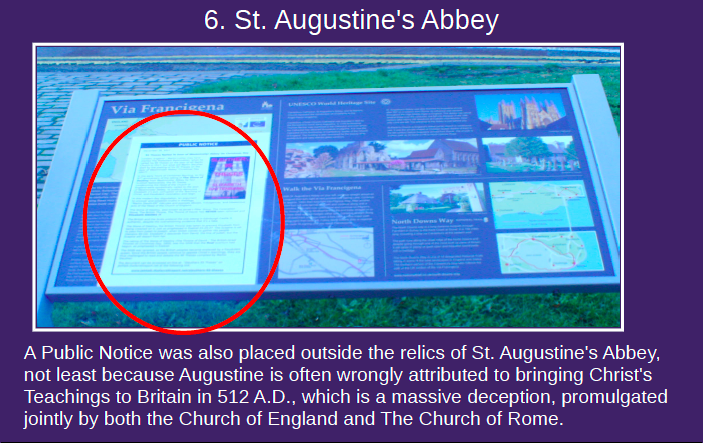 The Archbishop of Canterbury is urged to take note of the fact that besides Sleuth-ER’s 95 Theses being presented to Westminster Abbey at 4am on Christmas Day 2017, a Public Notice has been mounted on, and in some instances nailed to, the doors of a selection of strategically important churches and cathedrals the U.K, and beyond. 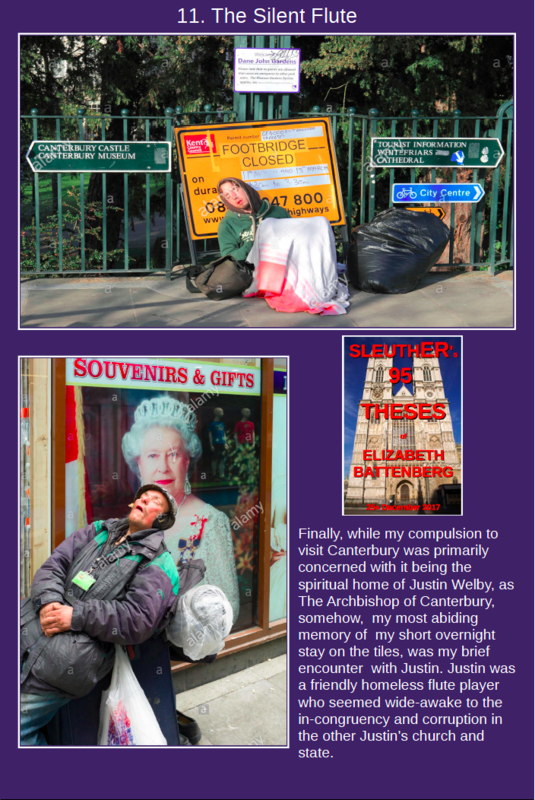 Besides the doubling up on Westminster Abbey, Westminster Cathedral, Buckingham Palace, and your own Lambeth Palace, were all given the once-over, as can be seen below. Likewise, churches and cathedrals in other strategically important locations elsewhere in the United Kingdom, and Ireland, have to varying degrees, had their awareness heightened about extremely shocking and shameful insights into The British Monarchy, and the fake queen Elizabeth, who has NEVER been Lawfully crowned in the eyes of God, Who had The Throne removed from Westminster Abbey by 4 Scots Nationalists, to prevent her from having a Lawful coronation. 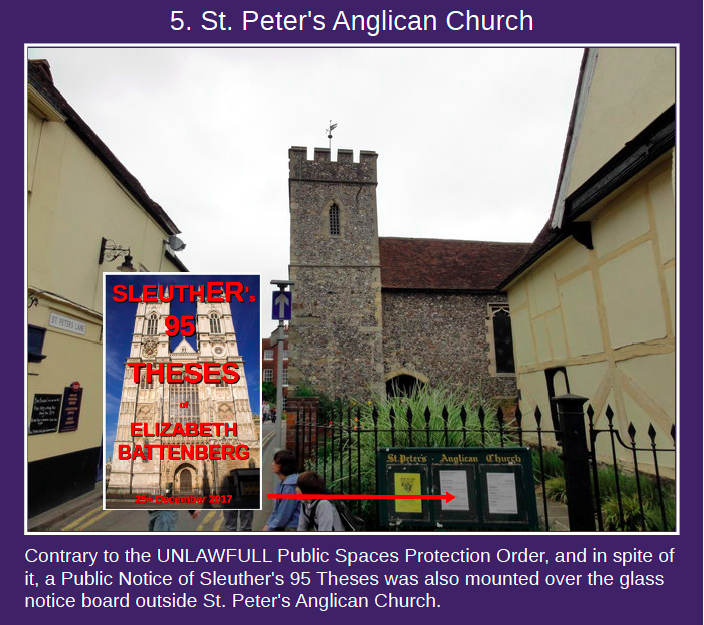 The compelling evidence within “Sleuth-ER’s 95 Theses” represents a truly shocking indictment on Elizabeth Battenberg. Elizabeth’s criminal and spiritually-inept conduct, ever since her fraudulent coronation ceremony in 1953, has been exposed here for all and sundry to see. The ongoing arrogance manifesting itself by a continuation of the wilful blindness shown by the church and state over such grave matters, will surely bring ruination upon the people of England. The Archbishop of Canterbury is asked to be also mindful of Sleuth-ER’s recent communications with the following personnel. iii. 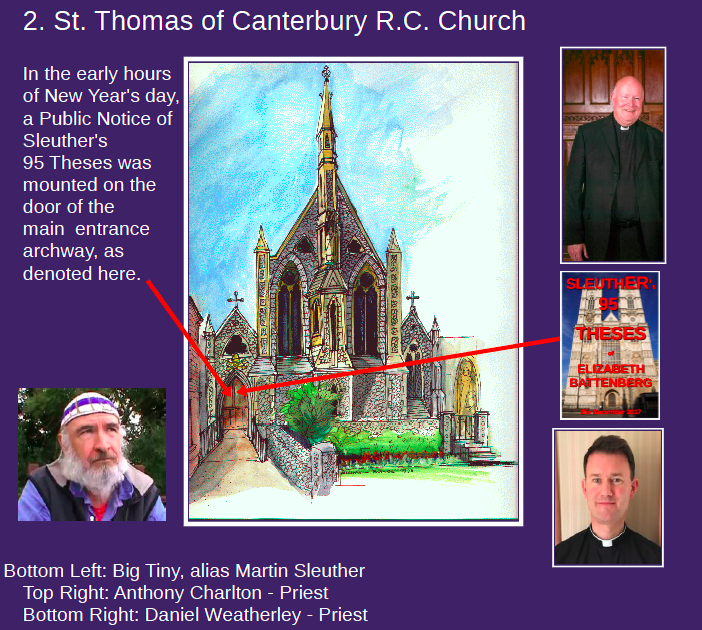 Daniel Weatherley, a Roman Catholc Priest from the church of St. Thomas of Canterbury. vi. Archbishops in The Church of Ireland, and The Roman Catholic Church, in the provinces of Dublin and Armagh. vii. The Archdeacon of St. Peter’s Roman Catholic Church in Drogheda, Ireland. 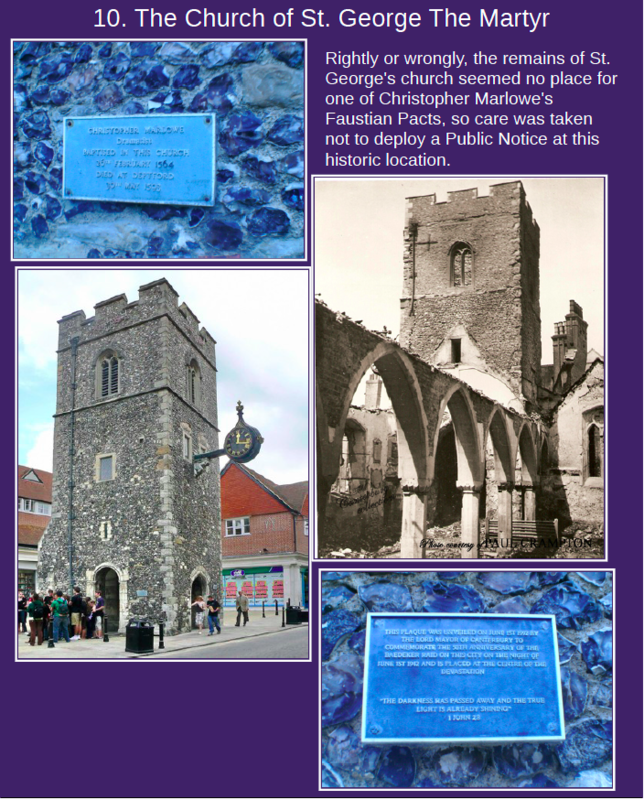 Please note also that SleuthER’s journey for the Canterbury stage is chronicled at the end of this letter, and may be of extra local interest. Relevant facts from Elizabeth’s coronation, as presided over by The Archbishop of Canterbury, Geoffrey Fisher, assisted by The Moderator of The General Assembly of The Church of Scotland, and the Dean of Westminster, are as follows. 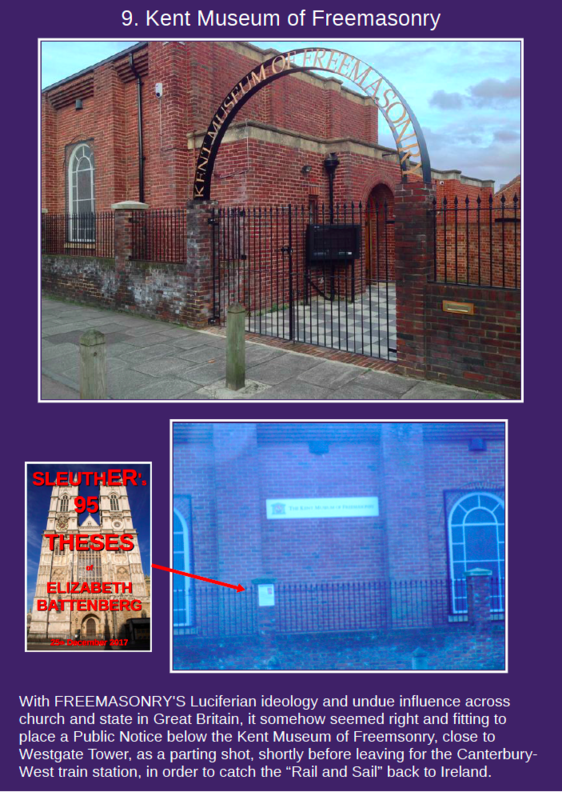 After verbally swearing to maintain “The Laws of God”, to the UTMOST of her power, Elizabeth then went to the steps of the alter to confirm before God, the promises she had just made. At the steps of the alter, Elizabeth made her solemn Oath in the sight of all the people, and the whole world, laying her right hand upon the Holy Gospel in the great Bible (which had been before carried in the procession and had been brought from the altar by the Archbishop, and tendered to her as she knelt upon the steps). Then Elizabeth kissed The Bible and signed the contract. A scanned copy of Elizabeth’s signed Oath confirms. In short, Elizabeth swore, to and before God, and the British people, and the whole world via TV, to do her UTMOST to maintain “THE LAWS OF GOD”. What are THE LAWS OF GOD? The BBC commentator describes it thus. And now for the first time, in the many times of this ancient ceremony, Scotland’s church takes part. The Moderator of The General Assembly of The Church of Scotland, receives the Holy Bible from The Dean of Westminster, and brings and presents it to the queen. The LAWS OF GOD, also known as THE ROYAL LAWS, are unsurprisingly, and quite clearly, written in The Bible. The LAWS OF GOD forbid mankind from legislating any new “laws”. Therefore, since Elizabeth swore not to legislate as part of the contract between herself and the British people, the first time she gave royal assent to a piece of legislation, she was in breach of her contract. In effect, this makes that contract NULL AND VOID. Her actions were and still are tantamount to an abdication of The Throne. It follows that any and all legislation being used is fraudulent and un-Lawful. Thus, Elizabeth or “Regina/queen”, as she is known in the courts, has NO LAWFUL authority to bring charges against anyone, ever. It is abundantly clear, that shamefully no-one, has been, or is holding Elizabeth to account, for all her Unlawful actions over her sixty-four and a half years of absolute treasonous misrule. 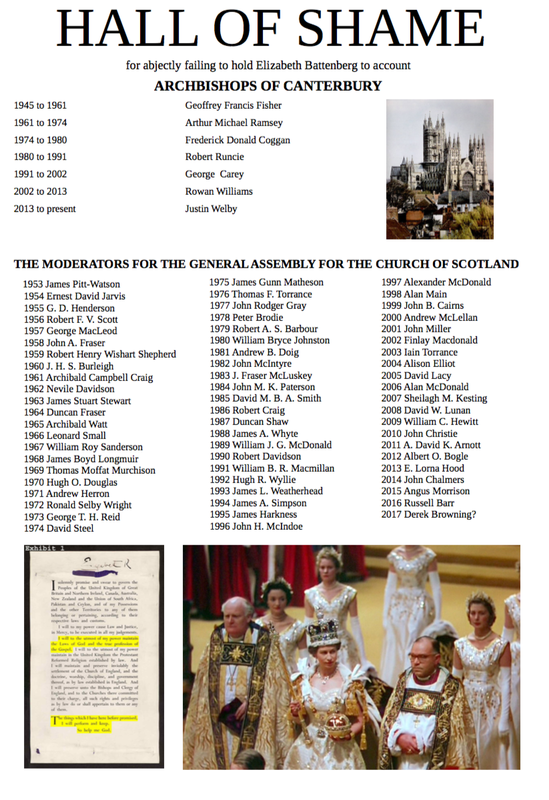 All past and present post-holders for the positions of The Archbishop of Canterbury; The Dean of Westminster; and especially The Moderator of The General Assembly of The Church of Scotland; have abjectly failed in their duties to God, and the British people, in this vitally important context, i.e. to maintain the Laws of God. For the well-being of both the church, and Great Britain and Ireland as a whole, it is imperative that The Archbishop of Canterbury takes appropriate action to help put a stop to all the pretence, and that he educates himself and others in The Truth behind The British Monarchy. The Archbishop of Canterbury and all his entourage, must face up to, and confront the enormous implications for The British nations. There can be no shirking this responsibility, if The Wrath of God is to be avoided. Whether you realise it or not, intrinsically linked to this issue is The Lia Fail / The Stone of Destiny / The Coronation Stone / The Throne / Bethel. In Truth, these names all refer to Jacob’s Pillar from Bethel. It is imperative that responsible members of The Church of England, properly educate themselves on the enormity of the issues at stake here, and cease forthwith to countenance the perpetuation of the sixty-four years of deceit and wilful blindness demonstrably shown by both church and state over the affairs of God and Christ, the latter being already here on Earth in His Second Coming. 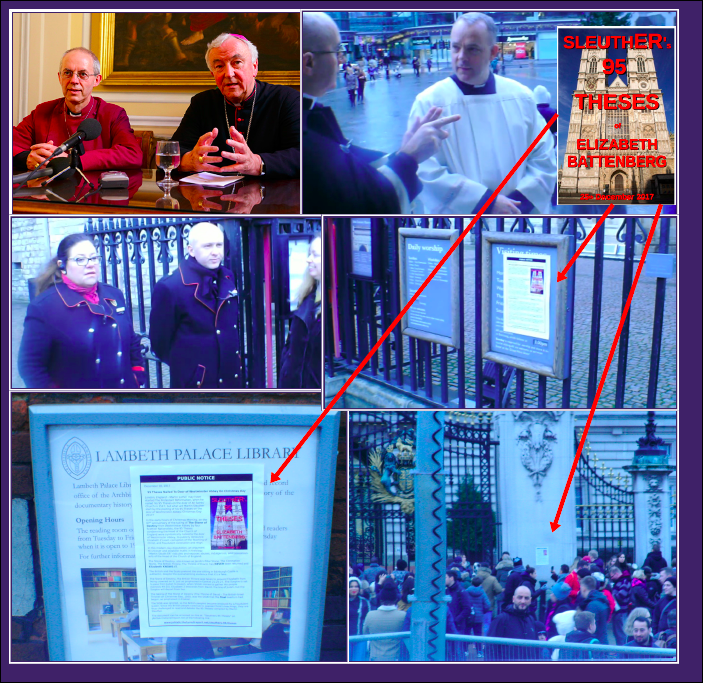 The Archbishop of Canterbury is urged to study the following five articles concerned with Christ, and The Stone of Destiny, and in so doing, prayerfully and in humble thanks-giving learn to come to terms with the True identity of The British people. 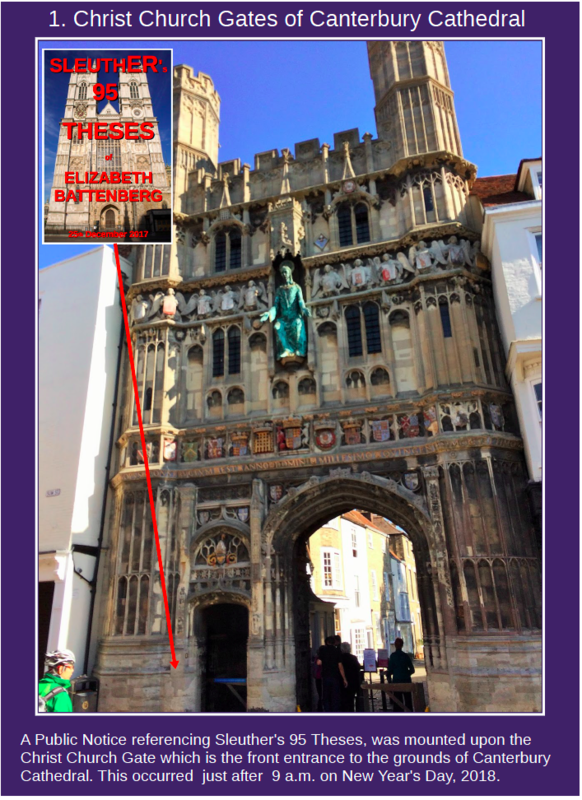 With immediate effect, collectively, the churches of Canterbury must publicly call for ELIZABETH TO GO, and simultaneously demand that the rest of the corrupt and obscenely self-indulgent fake British Monarchy step aside in favour of Christ in His Second Coming. Failure to heed this imperative, will soon bring down The Wrath of God down upon not just on Canterbury, but also on the Anglican church and the church of Rome. 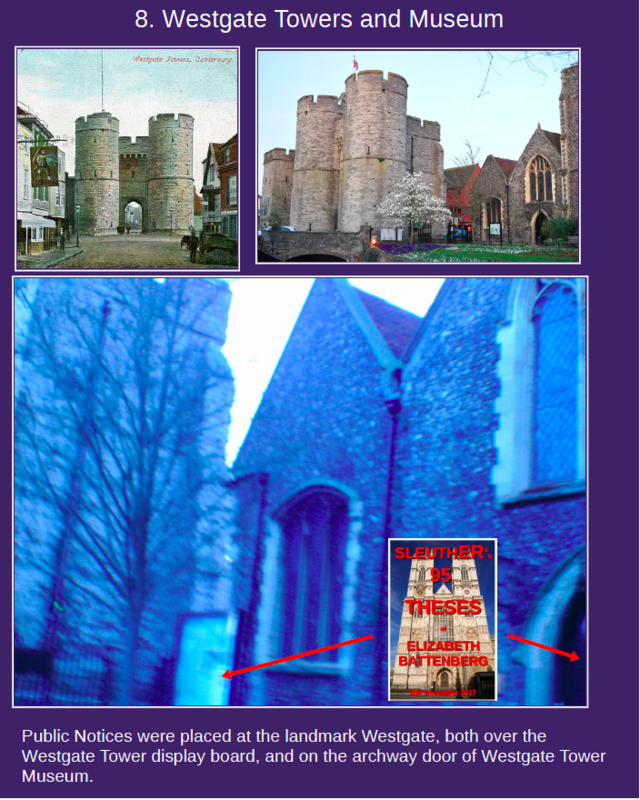 Collectively, the churches of Canterbury must cease all the deceptions which merely serve to hide the true identity of the British people from the public at large. The churches of Canterbury must publicly recognise that The British are The True Israelites, The People of The Covenant, and that the English people (Anglo-Saxons) descend from Jacob and Joseph / Ephraim and form an integral and pivotal part of the ten lost tribes of Israel. Collectively, the churches of Canterbury must repent before CHRIST for all their erroneous ways in leading their flocks astray about GOD’S LAW, by falsely teaching, over the course of modern history, that it has been abolished. Instead of using churches for all your false teachings, dished up with an array of traditional hymns and rituals, many of which are blasphemous to GOD, all church buildings must be handed over to Christ and used instead as Community Centres, and for the community to learn THE SONG OF MOSES and THE SONG OF THE LAMB.